I have discovered a significant benefit to Instagram—I get to look at other people’s food each and every day. When I don't feel that motivated to cook, I am inspired by the many wonderful creations that other people are sharing on Instagram. So, this past week, I shared a few food photos of my own and got some great ideas for future meals as well. Yesterday, another user shared a photo of a vegan soft serve ice cream cone with a maple cookie (dipped in chocolate) on top and I was delighted to find that it was from a bakery not too far from me. Let’s see how much time passes before I visit that bakery! Not much, I bet. So, follow me on Instagram. I will follow you back, and we can share food photos and all kinds of other good things! You can connect with me now using Followgram or search Instagram for @ziajojo. That’s the name my eldest (half Italian) niece gave me when she was a wee one. I promise not to show you too many photos of my dog Jolene...although she is pretty cute snoring away in the chair beside me right now! Here are some What I Ate Wednesday highlights from this past week. 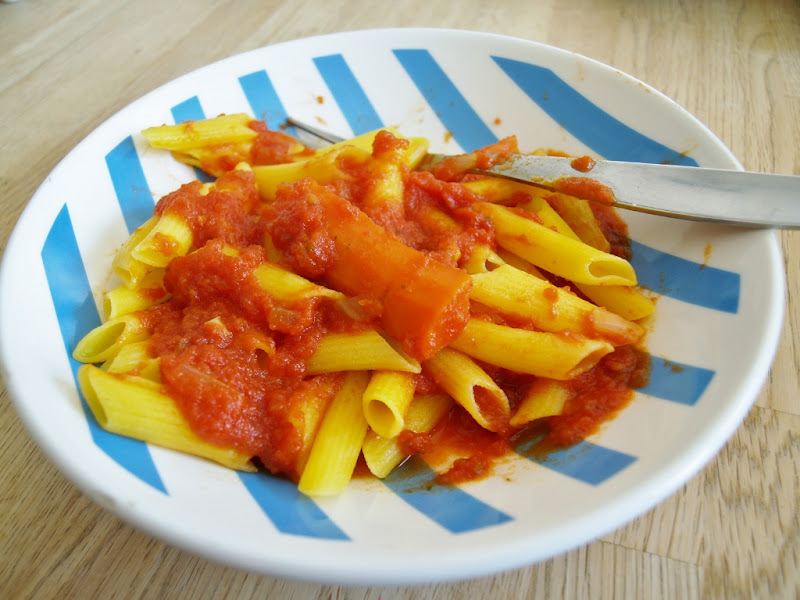 On Wednesday we had a simple dinner of gluten-free corn pasta with homemade marinara sauce. The corn pasta is new to me. It’s not bad at all. On Saturday, I tried a new-to-me recipe for tofu peanut rice by Nava Atlas. It was quite delicious. 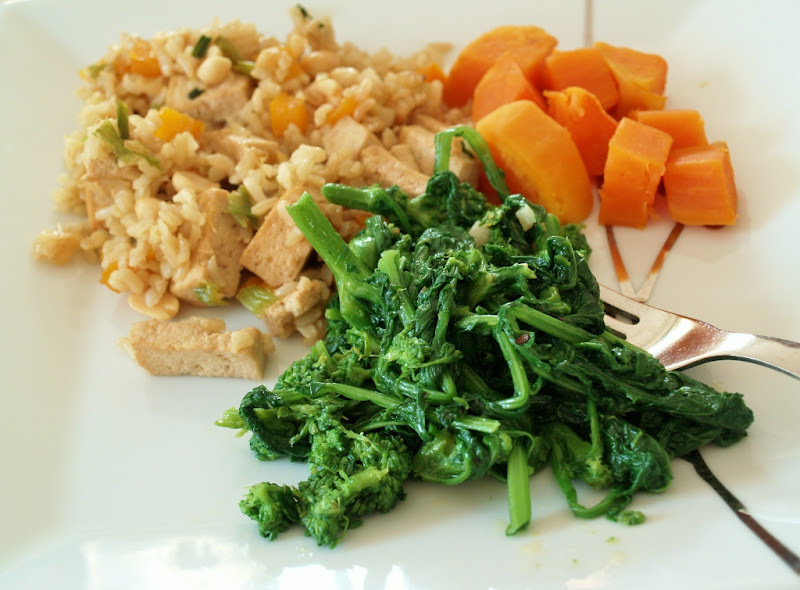 We served it with rapini sautéed in garlic and olive oil, as well as some simple boiled sweet potatoes. We had some of my son’s friends over to celebrate his tenth birthday on Sunday. 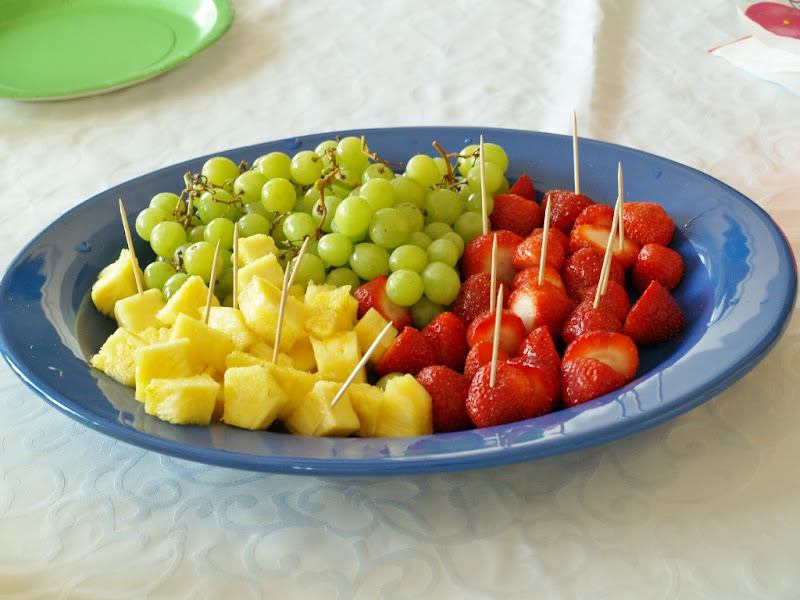 They had pizza, of course, as well as this fruit platter and a veggie platter of cucumbers, baby carrots and celery. I’m glad I put out the fruit and veggies, because they dug into it all! Makes a mom happy! My nine-year-old niece (who is sensitive to dairy) and I shared a vegan pizza. I bought spelt flour pizza dough at the health food store and topped it with Daiya vegan cheese. I had my doubts, but it was actually very good. 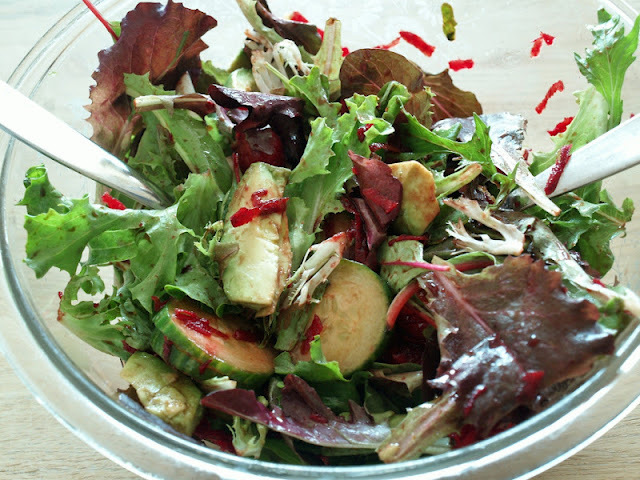 On Sunday evening, we had leftover tofu peanut rice with this salad of organic mixed greens, grated beets, sliced cucumber and avocado. We generally make a quick vinaigrette with olive oil, balsamic vinegar and salt, just as my Italian mother-in-law taught us. 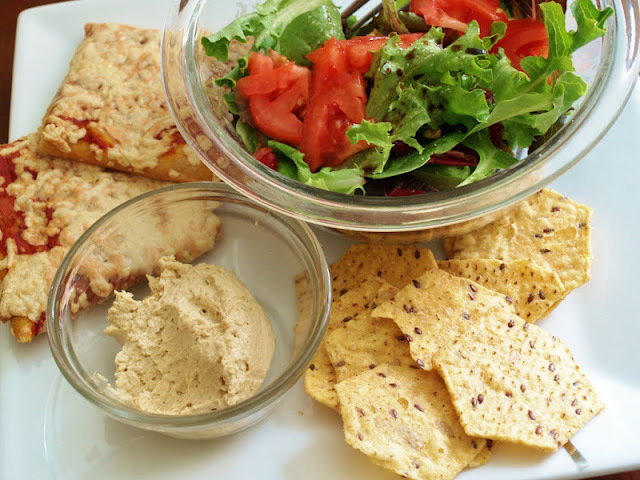 I had leftover vegan pizza for lunch on Monday, with a mixed greens salad, Food Should Taste Good crackers and baba ganoush. 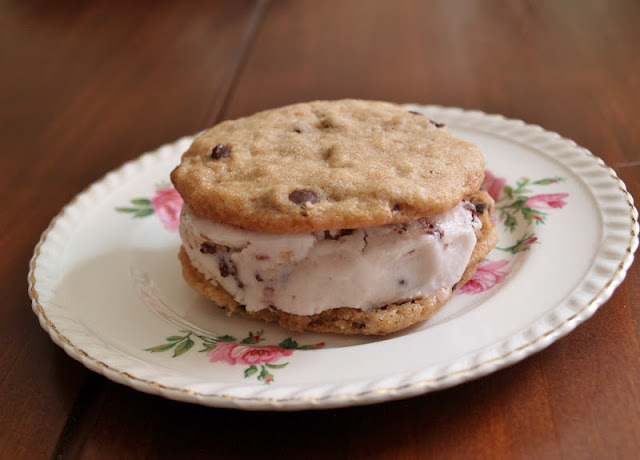 At the birthday party on Sunday, my niece couldn’t have the cake, so I prepared her an ice cream sandwich made from homemade vegan chocolate chip cookies and So Delicious peanut butter and chocolate ice cream. 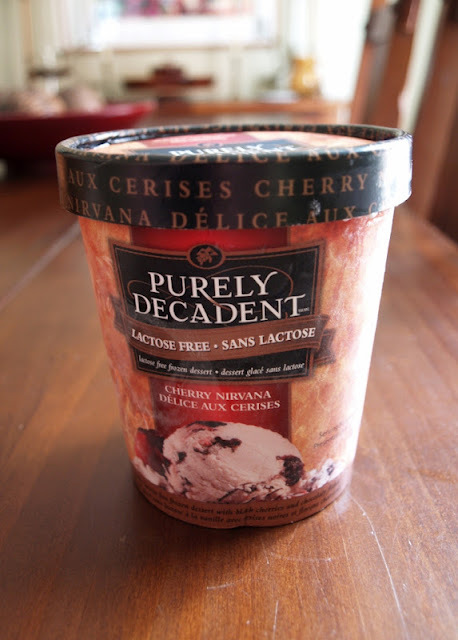 I had one later that night with cherry chocolate soy ice cream. Of course, food doesn’t photograph well at night, so I just HAD to make another one on Monday afternoon so I could show it to you. What I sacrifice for this blog, I can’t even tell you. How about you? Did you allow yourself any indulgences this week? Yum, everything looks great! That peanut tofu rice looks especially delicious. The veggies were cooked in sesame oil and then it is seasoned with some tamari. It was very tasty! I'm so glad you sacrificed to share another ice cream sandwich with us. Totally worth it! This is making me hungry. Yum... everything looks good but ice cream sandwiches really are the best. Must.have.one.now! Killer ice cream sandwich, by the way. Totally craving both cookies and frozen treats now! You are so funny, Hannah. I definitely want you to try Instagram, because I would LOVE to see what you are eating every day! Talk about inspiration! Oh, I know. Pinterest is so much fun. It's like tearing out the pages of a magazine (which I also often do). All of this vegan food is making me drool! 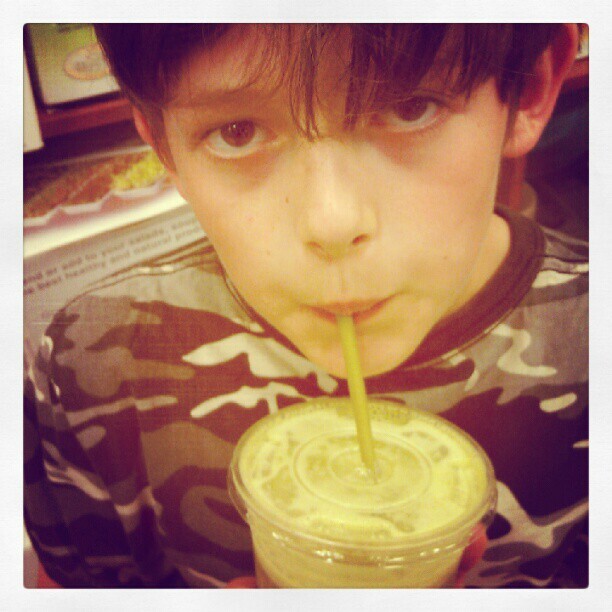 Are your kids vegetarian/vegan also? After discovering her intolerance, my mom bought gluten free pasta too. I really didn't notice much of a difference and I'm making it for us tomorrow in fact :D! I really want to try So Delicious ice cream and Daiya cheese also! Thanks Laura! We can "hang out" on Pinterest. It is fun, isn't it? Enjoy Father's Day! The tofu peanut rice sounds delicious! Gorgeous pics, too!